We are really proud of Sophie Hosking, who won the women’s lightweight double sculls to claim Britain’s fourth rowing gold medal of the London Olympics. 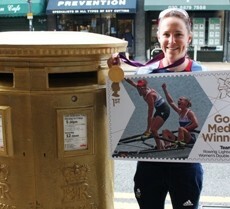 Sophie, who is from Wimbledon, has got her very own gold post box on Worple Road, marking her success at this years Olympics. We are not only delighted at the success of our Olympic Champions but also that their achievements have become part of Wimbledon’s heritage. The gold post box is history in the making and fits perfectly with the aspirations of the Wimbledon Way that aims to celebrate and promote Wimbledon’s rich heritage.